Our flagship product. Smooth day to night and night to day transitions with a simple yet powerful interface. Timelapse+ VIEW has been proven to work with DSLR and mirrorless cameras from leading manufacturers. Select one to learn more. There's nothing like a perfect transition from daylight to a starry sky; the blue sky of day drops out and dissolves into the depth of the emerging night sky. This is known as the "Holy Grail" of time-lapse photography, and has been a very difficult and technical pursuit. When Timelapse+ founder Elijah Parker got started in time-lapse, this was immediately a passion. The Original Timelapse+ Intervalometer was the first device on the market to automate night to day time-lapse using a light sensor and advanced algorithms. Building on that, the new VIEW Intervalometer is more advanced and analyzes each image for precise results across any range of exposure. Simply press start and let it follow the changes in light from day to night and even back again, no need to fuss with settings or monitor it along the way. The results are significantly better and smoother than the camera's aperture priority mode since by analyzing each image it can achieve a proper exposure for the Milky Way even when ramping from noon sun, while at the same time ignoring sudden changes such as from headlights. A brief walkthrough of setting up a day to night time-lapse using the VIEW Intervalometer. "Timelapse+ has definitely pushed intervalometers forward with the VIEW." "The Timelapse+ VIEW removes all of the complexities of capturing advanced time lapses and makes capturing a "holy grail" time lapse as easy as capturing a standard time lapse. Say goodbye to wasted nights of trial and error." "The easiest to setup yet most powerful exposure ramping device I've tested to date." If you've ever done time-lapse, you're probably well aware it involves a lot of patience. With the VIEW, there's now one thing you don't have to wait for: get an instant preview of the time-lapse even while it's still recording. Activated with just a wave of the hand, you don't need to worry about moving the camera. The preview can also be monitored from a smartphone. Besides being usable stand-alone, the VIEW can also be setup and monitored via a smartphone app, and even remotely over the internet when the VIEW is connected to WiFi. 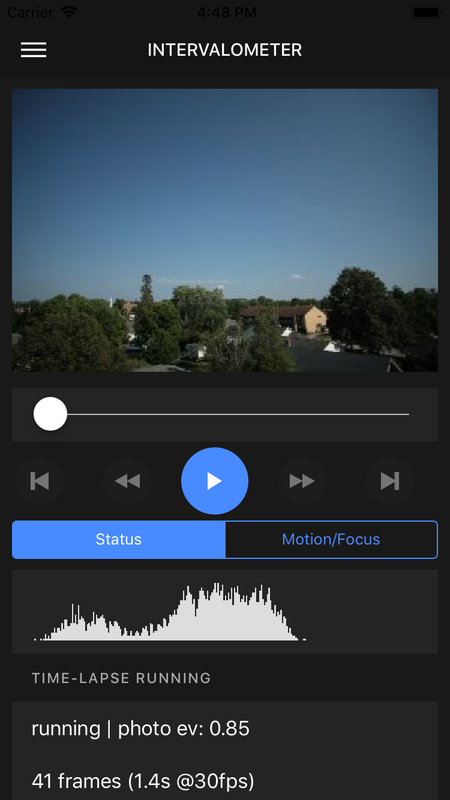 The app allows using liveview for motion keyframe setup as well as previewing the time-lapse while it's recording. The VIEW can synchronize with most motion systems for shoot-move shoot functionality, and additionally allows full integration with Dynamic Perception's NMX controller and Syrp's Genie Mini for full motion programming, including multiple axes and keyframes. With most Canon & Nikon DSLRs, as well as the Fuji X-T2, the VIEW is able to control the focus on AF lenses, and this can be programmed as keyframes to allow moving the focus to specific points during the time-lapse. Still somewhat experimental, results will vary between specific cameras and lenses. With a compatible pan/tilt motion system, the VIEW is able to automatically follow the sun or the moon while maintaining a level horizon (as apposed to a polar aligned system). It can also be set to pan at a steady 15°/hour for polar alignment as well. The VIEW can be programmed for preset exposures during each of the eclipse circumstances, with the timing calculated for the exact location. This allows you to enjoy the eclipse during the event but still capture everything as planned. Works great combined with the automatic sun tracking. More information can be found in the official documentation. ¿Hablas Español? Ya tenemos los documentos en Español, y ofrecemos soporte en Español también. The VIEW is a 100% custom hardware design, with every detail being considered in the design process. It is meant to be used in extreme conditions and can be operated with gloves. While touch screens are nice in optimal conditions, they're not what you want to use at -40°, so the design incorporates a simple menu interface with tactile buttons and a knob for scrolling and modifying settings. Does it work with my camera? The VIEW Intervalometer connects to the camera via USB and currently supports most Canon and Nikon DSLRs, Sony Alpha Mirrorless such as the A7 series and A6000 series, Fuji X-T1 & X-T2, and Panasonic GH3, GH4, GH5 & G9. A complete list of specific models is planned but not available yet. See http://docs.view.tl/#camera-support-overview for more info. Does it work with motion systems? Yes, the VIEW Intervalometer can synchronize with any motion system that provides shoot-move-shoot functionality. The motion system's camera trigger port can be connected to the VIEW instead of the camera, and the camera then connected to the VIEW. The VIEW's interval mode is then set to external, so the motion system controls the interval and motion, while the VIEW handles the exposure ramping. Alternately, if the motion system supports an external intervalometer, the VIEW can send the signal to the motion system for when to move. This allows the interval to be controlled by the VIEW making a variable interval possible. Can the VIEW be powered while in use? Yes, the VIEW can be charged/powered during use. The VIEW can last from 15 to 30 hours of continuous use with the internal battery, and can be powered by any USB power source. This allows for hot swapping external USB power packs as well. If the external power is disconnected or runs out, the VIEW will automatically switch to it's internal battery. What cables or accessories do I need? The VIEW includes a USB cable for connecting the camera according to the camera model specified during checkout. No other accessories or cables are needed, although for motion system synchronization you may want a 2.5mm TRS cable. If you have more than one type of camera you plan to use it with, you can purchase additional USB cables as needed. The VIEW package includes the VIEW Intervalometer, a micro-b USB charging cable, a USB cable for the camera, a small microfiber pouch and quick-start card. A charger is not included. However, you can use any USB source to charge or power the VIEW.